Having a hit song is great. Landing a song on Friends is better. 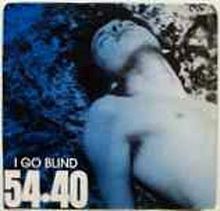 I heard on the radio that 54-40, a band I remember from the 80s, is still touring and recording largely thanks to “I Go Blind”, one of their first hits – if you can call it that. I say that because the song didn’t turn that many heads when it was released. It was kind of an also ran… Definitely not the band’s best work. 54-40 was an innovative, and definitely cool band that in spite of having a stream of catchy songs, never seemed to have traction… At least outside of Canada. That’s what makes “I Go Blind” interesting. Ten years after its release, Hootie and the Blowfish record it. Then the song appears in an episode of Friends. Friends of course is airing in reruns in every corner of the world probably hundreds of times a day. Anyone who’s received TV royalties knows what a sweet ride that can be. So decades later, thanks to the broadcast royalties, 54-40 have the freedom to record and perform all they want. The lesson? There’s more than one way to make a living writing and recording songs. Writing a hit is hard and increasingly elusive. Getting a song on a hit show… Maybe slightly more attainable. In hindsight, the song with its easy to get melody and repetitive lyrics (even for radio) is perfect for TV, where you have less time to take the song in. TV also prefers songs that pick one emotion and dwell in it, over the storytelling nature of radio songs. Though having the number one band and the number one TV show pick up your song is good too.